Benjamin Henrion who joined the July cartography workshop talked about the openstreetmap project(1). This Sunday, he will organise a first test of open cartography of the center of Brussels. Meeting Point at 10 AM Brussels Grand Place with your bike and a GPS. We will wander through the streets of the city center. Please add yourself on the participants list here. OpenStreetMap is a project aimed squarely at creating and providing free geographic data such as street maps to anyone who wants them. The project was started because most maps you think of as free actually have legal or technical restrictions on their use, holding back people from using them in creative, productive or unexpected ways. 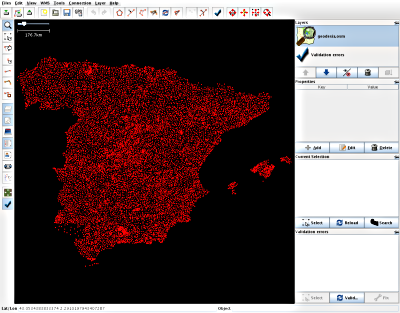 Spanish OSMers got permission to import goverment data into OSM. The first task has been importing the "ROI" geodesy network; supposedly this is the first time that data from a National Mapping Agency is imported directly into OSM. "ROI" stands for "Red de Orden Inferior", or "Lesser Order Network".